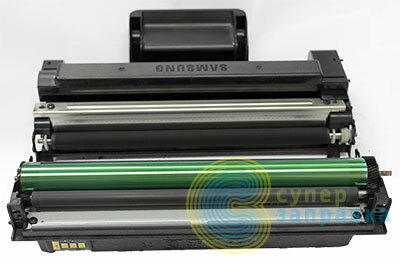 All these cartridges, which are listed in the title of the article, vary only by the size of the wasted toner tanks and the chips, which are controlling the certain amount of printed pages. Cartridge resources are: MLT-D205S – 2000 pages, MLT-D205L – 5000 pages, MLT-D205E – 10000 pages, 106R02308 – 2300 pages, 106R02310 – 5000 pages. Amount of pages is calculated as to 5% page filing. Also, we want to draw your attention to the certain changes in cartridge design. 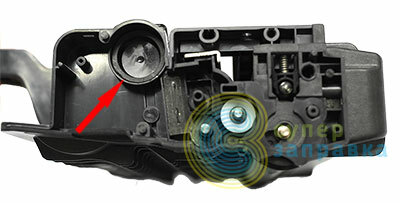 For some time past, Samsung has changed the design of a cartridge reduction block’s driving gear. The old gear had 39 teeth, new one is 59. Pinion gears have changed as well. Thus, OPC drum from the old model won’t suit new cartridges, please attend! The old gear had 39 teeth, new one is 59. 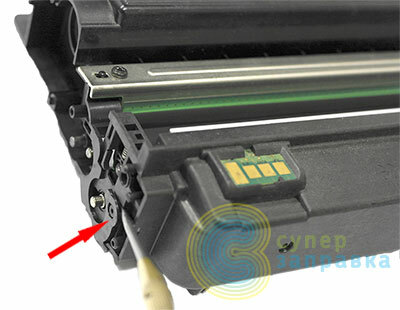 To disassemble the cartridge, you need to cut off the plastic rivets on the side lids of the cartridge. The best thing to use here is a sharp box cutter. Remember about safety measures during the work process. Also, to detach the lids you may use a flat screwdriver and insert it nearby the rivet in between the side lid and the cartridge body, and then twist a screwdriver a bit. The rivet should lose contact. We do not recommend you to do that, since you may damage the cartridge because of the lack of experience. After removing the rivets, carefully unclip plastic clips throughout the perimeter and at the same time take the side lids off. Take the driving gear off and do the same thing with the other side. Use your screwdriver as a lever and lift up the gear. Take off the OPC drum’s protective shutter. 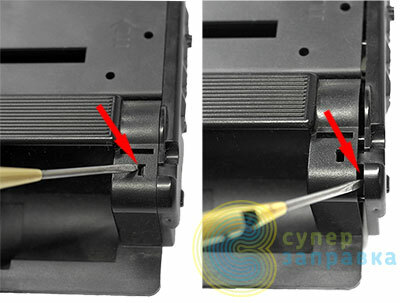 Carefully untuck plastic clips on the right and on the left side and separate the cartridge in two halves. Let’s first clean the wasted toner tank. Take off the OPC drum and the charging roller. 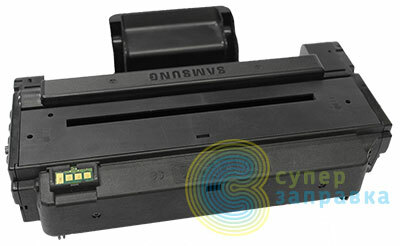 Unscrew the ink fountain blade and shake out all of the wasted toner. Also, you may replace the chip meanwhile. Bend the seal on the tank side and carefully break off the piece of plastic that hides the chip. Install the new chip. Place the plastic piece back. Check the seal. After that, place the ink fountain blade back. If it is dirty, than before installation, you need to clean the edge of the blade with pure benzine and powder it with the special talcum or with the toner. To clean the charging roller you may use the rag dampen in water or in the same benzine. Let the charging roller dry after cleaning. When done, assemble everything back. Let’s clean the development unit now. Take the development roller out. 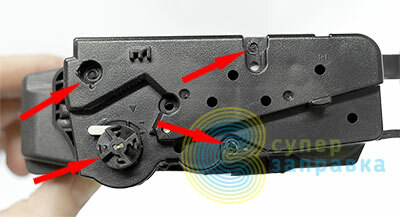 Unscrew the blade in developing unit. 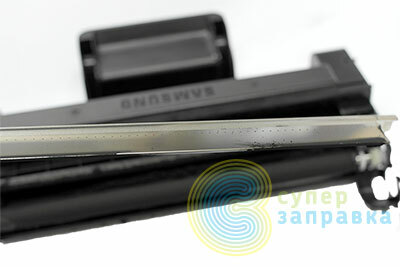 Clean the edge of the blade from baked toner leftovers with the rag dampen in pure benzine. Similarly, wipe the developing roller with the rag dampen in water, liquid for rubber recovery or benzine. Then, remove all the toner leftover from cartridge using the vacuum cleaner, or, simply shake it out by tapping the cartridge with your screwdriver. Assemble everything backwards. Couple the halves of the cartridge. Place the protective shutter of the OPC drum and the lid on the side of the reduction gear. Open the cap up and fill the new toner in. Place the second side lid back. The cartridge is refilled. If you decide not to change the chip while refilling, then you need to upgrade the device with the new firmware, that will kill the control function of the chip, otherwise your cartridge won’t work. 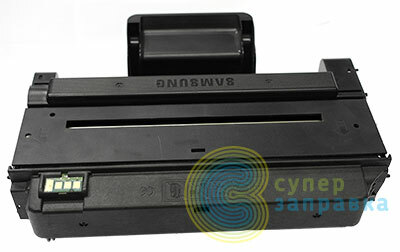 You may also bring the Samsung MLT-D205S cartridge to our maintenance shop and we will refill it during 10-15 minutes, we look forward to seeing you!